Cradlecrush Rock is a small giant camp containing only one giant. It is found downstream from Valtheim Towers and Darkshade. To reach it follow the road from Valtheim Towers east. Shortly after a hairpin bend to the right at the bottom of the hill, you will see a ford on your left with an iron ore vein visible on the other side. Follow this path up to reach the camp. The camp consists of a central campfire that has been extinguished, two mammoth cheese bowls, a stacked woodpile with a dead painted cow on top which can be looted for raw beef and a cow hide, an unlocked chest with a leveled healing potion and a leveled stamina potion next to it, and a huge pile of straw that probably serves as the giant's bed, though you will never see him sleep in it. 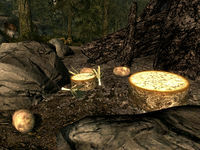 Among the ashes of the fire you will find three potatoes, three leeks, a sliced Eidar cheese and an unusually-large Eidar cheese wheel, the largest of these to be found in the game. A single stake with a cooked skeever is propped up over the fire, which can be looted for a charred skeever hide. 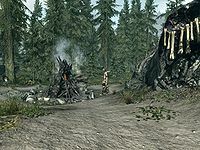 320 feet east-northeast of the camp is an unmarked location containing a Shrine of Talos, an unlocked chest, and a copy of the Heavy Armor skill book 2920, MidYear, v6. A few feet to the west of the campfire, a knapsack, a leveled enchanted helm, and a ring can be found on three separate skeletons that appear to have been crushed by a huge rock, though how this came to pass is unknown. Cradlecrush Rock appears as a fort in ESO. This page was last modified on 12 April 2017, at 05:00.